RSNA boasts beautiful slopes and loops underneath towering umbrella magnolia and hemlock. With melting frosts and heavy rains come delicate waterfalls over the sandstone overhangs, as daffodils and snowdrops poke out of the ground to greet the coming Spring. 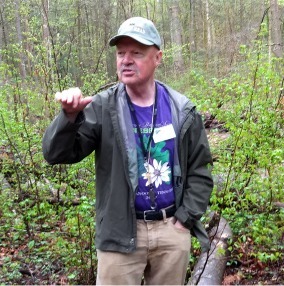 We will have a special interpreter for the longer wildflower hike on April 20, Dr. Larry Pounds. Larry is a field botanist and environmental consultant who recently completed a wild and endangered plant survey on the already-built sections of the Cumberland Trail. He co-authored Wildly Strolling Along: Father-Son Nature Adventures on Tennessee’s Cumberland Trail with son Ben Pounds, who writes for The Oak Ridger. This is a fun book with cartoon illustrations and short essays on a wide range of both serious and wacky topics, plus suggestions for further reading that cover all aspects of cultural and natural history along the trail. 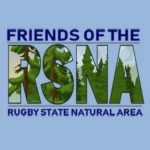 A few years ago Larry did an interpretive hike with RSNA Friends when late summer wildflowers were blooming, so we’re looking forward to his return to help us identify and learn more about the springtime bloomers. We meet at 10:00 AM in front of the Historic Rugby Visitor Centre. We will walk through Beacon Hill to the secret Hughes Trail, but use the old hillside roadway to get to the White Oak Trail rather than continuing on Hughes Trail (pretty much a wildflower desert at present). We found the old roadway full of wildflowers just like the section of White Oak Trail that goes down the hillside to Rita’s gate at the foot of Horseshoe Bend Road. We’ll continue on White Oak Trail to toward the Parkway as we did on March 23. From the top of the White Oak Connector, we can walk the Parkway back to the Visitor Centre, or jog down to the Cox Branch Trail and follow Cox Brach, Allerton Ridge and part of Massengale Loop back to the VC, taking another look at flowers we saw on that route this past Saturday. Total distance is about four miles, but there are a couple of jumping off points for folks who need to leave the hike early. This is an easy to moderate hike, and we’ll be stopping frequently to identify and talk about what we see. Be prepared for a couple of stream fords and some mud underfoot in a few spots. Bring whatever rain gear, insect repellent, water and snacks you need for the weekend weather.